The premiere U.S. jewelry trade show circuit gets an energizing infusion of Mediterranean beauty and vision this year when Greek Jewels , a group of approximately 15 fine jewelry designers, introduce their extraordinary collections at LUXURY, JCKâ€™s invitation-only fine jewelry trade event, at The Venetian Las Vegas from May 29 - June 3, 2019 and at JCK Las Vegas , the largest and most renowned jewelry trade event in the world, taking place May 31 - June 3, 2019 at the Sands Expo & Convention Center, Las Vegas, NV. 'Where Classic Design Meets Modern Desire ', is the tagline of Greek Jewels , and it succinctly sums up the unique design philosophy that has jewelry lovers and collectors flocking to Greece. From venerable fine jewelry houses that have existed for generations to young, contemporary new designers, Greece has become a mecca for those all over the world who seek exceptional, fine jewelry created with the highest quality materials and artisanal techniques that have been reinterpreted in modern designs. Among them, three stunning collections not to be missed from Samoli and FaCad'oro who will exhibit at LUXURY, and Anomy who will be seen at JCK, Las Vegas. Mary Samoliâ€™s handcrafted jewelry is heavily inspired by nature and its elements, created using a traditional wax carving technique that only a few jewelers use. Designed with 18k gold and sterling silver, her arresting collections beautifully mix aesthetics, from abstract and earthy, amorphous designs to contemporary, minimalist pieces; from solely gold to pieces sparkling with precious gems and pearls. FaCad'oro , one of Greece's largest jewelry companies, continues its grand tradition with second-generation owners. With high customer loyalty and strong brand awareness. 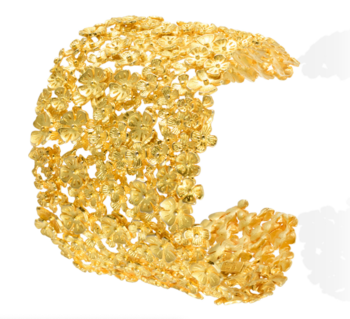 FaCad'oro's success lies in extraordinary, diverse collections, encompassing a wide product offering including bridal, engagement and occasion pieces in 14K or 18K gold, as well as singular creations adorned with precious or semi-precious stones. Each piece of FaCad'oro jewelry bears the company's stamp and is accompanied by a life-long guarantee of authenticity and value. Contemporary, fashion - forward and highly unique, Anomy's aesthetic reflects founder/designer Katerina Marmagioli's design philosophy of "...making harmony and beauty out of elements that don't automatically match ." Offering earrings, rings and necklaces often in an asymmetrical design, Anomy's pieces are spectacularly unique yet versatile enough to wear for all occasions, by all ages. Katerina brings her global exposure to diverse, exciting styles and cultures for incredible inspiration and sourcing of finest materials, including pearls from the Pacific and Hong Kong, diamonds from Antwerp and the colored gemstones of Idar Oberstein, Germany. Anomy can be found at jewelry retailers in the United States. To learn more or to make an appointment please contact Katerina Marmagioli at Anomy. From Anomy's vibrant Explosion Collection, a statement ring like no other. Glittering with a 7 x 9 mm center stone of deep red tourmaline, this exquisite 14k rose gold ring explodes with color, featuring 24 rubies, 22 pink sapphires, 24 diamonds (approximately 0.34 tcw) MSRP: $4,200. To schedule appointments with individual designers please contact greekjewels@enterprisegreece.gov.gr.